CORRECTING LABIAL THICK AND HIGH ATTACHED FRENUM (CLINICAL OBSERVATION). 1) Department of Orthodontics, 2) Department of Pediatric Dentistry, 3) Department of Oral Surgery, 4) Student, Faculty of Dental Medicine, Medical University Plovdiv, Bulgaria. Labial thick and high attached maxillary frenum is commonly regarded as contributing etiology for maintaining midline diastema and upper jaw delayed development. The surgical modalities used to solve this problem are known to be quite stressful for children. Dental lasers have recently been increasingly used to treat wide variety of problems in medicine. AIM: Using a high energy diode laser to remove a short, high attached frenum of the upper lip and present the results of the procedure. MATERIAL AND METHODS: We performed frenectomy in 10 randomly selected patients of both sexes aged 7-9 years with short, thick frena of the upper lip. A Picasso soft tissue diode laser, class IV, power output 7 W, λ-810 nm was used for the procedure. RESULTS AND DISCUSSION: The healing process was uneventful, painless and without edemas developing in the soft tissues. No inflammation was found in the treated tissues. The children undergoing the procedure showed no fear. This was the reason why we preferred to use lasers as a modern therapeutic modality for soft tissue correction in the mouth. CONCLUSION: Using lasers to remove short, high attached maxillary labial frenum has the benefit of inducing less stress in children than that they experience if anaesthesia and surgery are administered. Anaesthesia with topical anaesthetics is used in the procedure. The postoperative period is free of pain and far from severe. This makes this technique particularly useful for children. Key words: maxillary frenum, frenectomy, diastema, laser. Please cite this article as: Krusteva S, Dimitrova M, Daskalov Hr, Krusteva St. Correcting labial thick and high attached frenum (clinical observation). J of IMAB. 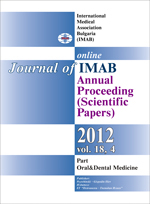 2012; 18(4):263-265. doi: 10.5272/ jimab.2012184.263. 7. Lalabonova Hr. Low intensity lasers in the surgical protocol if the dental implantology. J of IMAB. 2011; 17(2):104-106. [CrossRef]. 11. Yordanova S, Yordanova M, Tomov G, Lalabonova Hr. Er:YAG laser application in orthodontic practice. A case report. J of IMAB. 2011, 17(2):129-131. [CrossRef] .